Mirror test hints at cognitive abilities in fish - SABC News - Breaking news, special reports, world, business, sport coverage of all South African current events. Africa's news leader. When applied with a brown-coloured mark on the fish's body in a place that could be seen only in a mirror reflection, the fish tried to remove the marks by scraping their bodies on hard surfaces after watching themselves in a mirror. A small tropical reef fish was able to recognize itself in a mirror; scientists said in a finding that raises provocative questions about assessing self-awareness and cognitive abilities in animals. 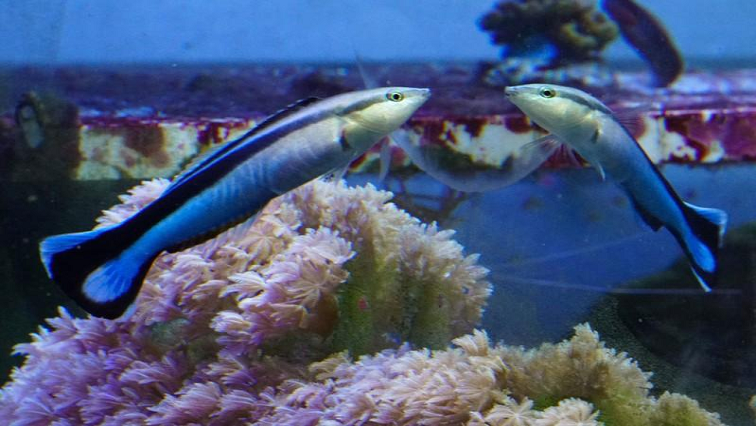 The study involved experiments in which the fish species Labroides dimidiatus, called the bluestreak cleaner wrasse, was given a mirror self-recognition test, a technique developed in 1970 for gauging animal self-awareness. In aquarium experiments at Osaka City University in Japan, the researchers applied a brown-coloured mark on the fish’s body in a place that could be seen only in a mirror reflection. The fish tried to remove the marks by scraping their bodies on hard surfaces after watching themselves in a mirror, but never tried to remove them without a mirror present; indicating they understood the reflection was of them, the researchers said. When a transparent, rather than brown, mark was applied, the fish never tried to remove it. The 10-cm species consumes parasites and dead tissue off skin of other reef fish in a relationship benefiting both. The brown mark’s colour resembled the colour of these parasites. The fish “shows behaviours during the mirror test that are accepted as evidence for self-awareness in many other species,” said evolutionary biologist Alex Jordan of the Max Planck Institute for Ornithology in Germany, who led the study published in the journal PLOS Biology. Jordan, however, questioned whether the test represents are liable measure of animal cognitive abilities. “I don’t claim that fish lack self-awareness, but rather that the minimal required explanation for the behaviours we observe in the mirror test does not require invocation of self-awareness, self-consciousness, or theory of mind,” Jordan said. The test has been passed by great apes including chimpanzees, bonobos, gorillas and orang-utans as well as dolphins, killer whales, an elephant and a magpie species, but failed by some other animals. Humans pass it at around 18 months old. This entry was posted on 08 Feb 2019,03:43PM at 3:43 PM and is filed under Sci-tech, Homepage Featured Story Slider. You can follow any responses to this entry through the RSS 2.0 feed. Both comments and pings are currently closed.